Organisation: Andhra Pradesh police Department. Name Of the Examination: Constable Mains Exam. Syllabus: Reasoning, Logical Mathematics, General Knowledge, Current Affairs, English and other languages Etc. Dates of Exams: 22nd Jan 2017. Click on the direct link provided here. 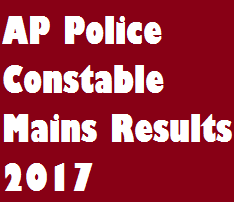 The AP Police Constable Mains Result will be displayed on screen.Check the result, score and take a printout of the result for further proceedings.